Just before 13:30 hours Lehigh Township Fire 47 was dispatched to 311 Mulberry Drive for a house fire. On arrival, Northampton Borough chief 47 took command. He had a large McMansion home with fire showing. Crews stretched 2 hand lines in the front door and hit the fire in a rear room on the first floor with a fireplace attached to it. 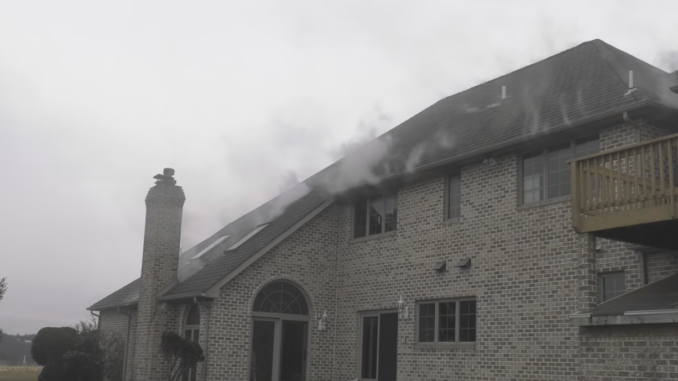 In the rear, fire was coming through the roof just behind the chimney. Interior firefighter made quick work of the fire and didn’t waste time opening up walls and ceilings to stop the fire from extending. Multiple mutual companies responded with tankers and engines from two counties.